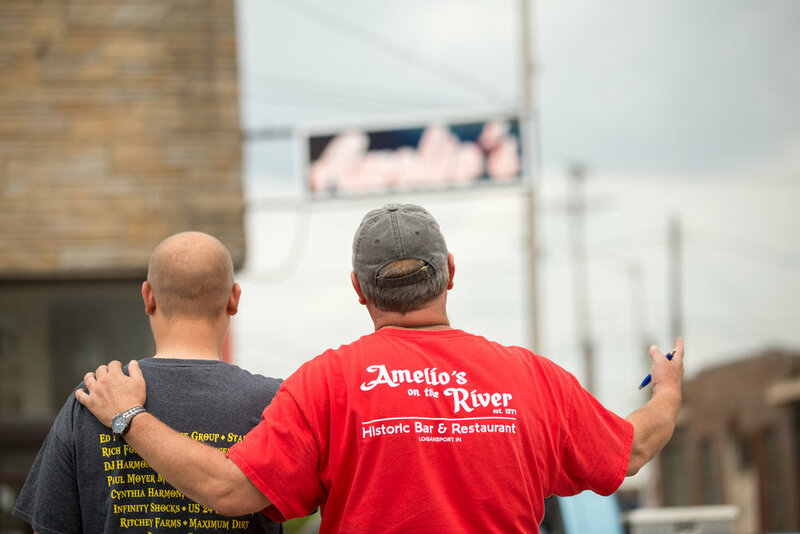 Located in Logansport, Amelio's on the River is a purveyor of fine Italian and American dining from the esteemed Paul Ulerick. Amelio's on the River opened in 1871 and is located in Logansport, Indiana. Since then, it has been passed down to different owners over many generations. Truly a cornerstone of local history, this building even survived the Great Flood of 1913 and has a bronze plaque marking the height of the flood and date. The restaurant was most recently purchased and renovated in 2015. Our large seating area can accommodate parties as large as 100 people for a variety of special occasions. 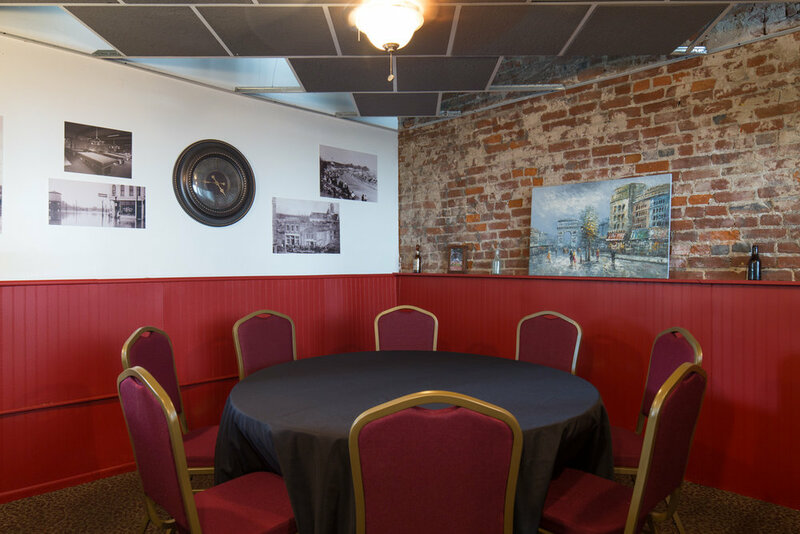 We also have a private dining room available upon request for parties of 8 or less. Come visit us for some of our world famous meatballs or stop in for a drink at our historic bar! Burgers – Build Your Own! The tenderest beef cut. Lean yet succulent and elegant. Melt-in- your-mouth texture. This boneless steak is rich, tender, juicy and full-flavored, with generous marbling. This is a steakhouse classic, known for its marbling, tenderness and flavor. Lean, well-flavored and moderately tender beef at an affordable price. Our great ground beef without the bun. All pasta dinners are served with a small salad and a side of garlic bread. Add an additional meatball for $2. Served on the Rocks or frozen in lime or strawberry with Patron Tequila. Our version of a Long Island Iced Tea is a potent combination of Vodka, Rum, Gin, Tquila, Lemon, Lime & a splash of Coke. Spiced rum & fruit punch make a sweet and tasty treat as old as the bar. Chilled Bourbon with sugar, lemon juice, an orage slice & Maraschino Cherries. A classical sweet wine with a wonderful bouquet & taste. Suitable with all kinds of spicy foods & deserts. Golden in color with a bouquet that is fragrant & intense. The fresh fruit flavor has hints of peach, apricot & finishes with a touch of honey. Lovely perfume aromas of ripe melons, honeysuckle in summer, & cherry blossoms in spring. The flavors are bright & delicately sweet. A fantastic Italian selection. A fresh dry wine with a fabulous floral bouquet. Wonderful aromas of summer-ripe peaches with tropical fruits & flowers. Smooth flavors of baked apples & toasty vanilla bean. A white grape variety which originated in Germany. An aromatic grape variety displaying flowery, almost perfumed, aromas. Delicate and graceful, yet bold and powerful. Combines aromas of vibrant plum, cherry & spices. This is a silky, subtle yet robust and bold wine. Concentrated fruit clusters produce intricate flavors & aromas. Aromas of sandalwood, currant & plum that pleasantly lead to enticing flavors of blueberry, blackberry and violet. Dark, deep purple in color & has a brooding perfumed bouquet. A red blend with rich and ripe flavors. Logansport was settled circa 1826 and named for a half Shawnee solider named James Renick-Logan, better known as “Captain Logan” who served as a scout for U.S. forces in the surrounding area during the War of 1812. Logansport was established as an Indian agency and trading post as the frontier moved westward. The Wabash River and Eel River merge in Logansport and made it a natural meeting point for the native Indians, trappers and settlers in the area or just passing through on the way further west. Logansport would go on to have a diverse transportation history. The Wabash & Erie Canal reached Logansport in 1837, contributing the “port” to Logansport’s name, as in “Logan’s port”. The Historic Michigan Road runs through town. Michigan Road was one of the first roads in Indiana. It runs from Madison, Indiana (South), to Michigan City, Indiana (North). Several different passenger and freight train routes also served Logansport. At one time 256 trains a day traveled through town. We were known as the “City of Bridges” in reference to our many railroad bridges. Amelio’s has been part of the scene in Logansport since 1871 when it first opened as a saloon. Part of an Italian neighborhood close to the Wabash River, canal, highway & railroad, it has been a restaurant or bar in continuous since its founding. The 1869 city directory contains a listing for John Mitchell at 39 Canal Street (the original address for Amelio’s). Two years later it listed Joseph Matt as the keeper of a saloon at that address. Matt operated the saloon until at least 1900. From that point through the mid-1920’s, Matt apparently leased the property to various individuals, who followed one another as operators of the saloon in rapid succession. In 1901 and 1902, for example, Louis Sewnig and his son ran the saloon. They advertised a selection of fine wines and liquors and declared oysters and clams as specialties. The next year the saloon was being run by John Cain. From 1919 to 1933, the dates for Prohibition, the proprietors of the former saloon sold soft drinks instead of alcoholic beverages. In January 1924 Nicholas Amelio began operating the establishment as Nick’s Place. He purchased the bar in 1939. There’s a picture of the saloon at that time hanging by the entrance to the main bar today. In 1958 Amelio’s son Francis, who had assumed ownership, renamed the restaurant and tavern Amelio’s. In 1982 Amelio’s sold the business to Ken Renkenberger. The following year Tom and Loretta Keplar purchased the tavern, which they continued to operate as Amelio’s until 2008 when Larry Isaacs took possession and renamed the tavern Amelio’s and Ike’s. We purchased the historic bar and restaurant in January 2015, with big plans for the future. We have renamed the old bar once again, this time to “Amelio’s on the River”. It honors our history and reflects our long-time location here on the banks of the Wabash. An article from the Pharos-Tribune newspaper regarding the purchase proudly hangs in the main bar. We are famous for our meatballs and steaks and have been for over 100 years, with fans from around the world. We intend on keeping it that way! 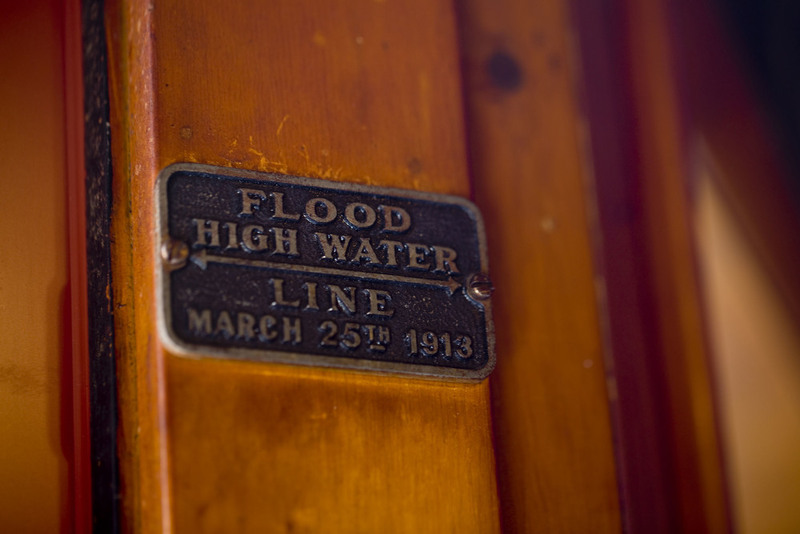 And lastly, don’t miss the bronze plaque inside the tavern that indicates the high-water mark from the Great Flood of 1913. It will take more than that to stop Amelio’s! Thanks for stopping by Amelio’s. You won’t be disappointed! Reservations recommended on Friday and Saturday nights and required for parties of 6 or more.